Good evening! While I was away at the Inspire Create Share 2015 Stampin' Up! Convention last week I had the opportunity not only to see all of the amazing brand new products but to play with them as well! One of the highlights of my trip was the Product Spotlight which was in a classroom hidden all the way in the back of the Salt Palace. In this class- we learned some more about the Home for Christmas product suite AND we got to make this adorable little Santa tag. 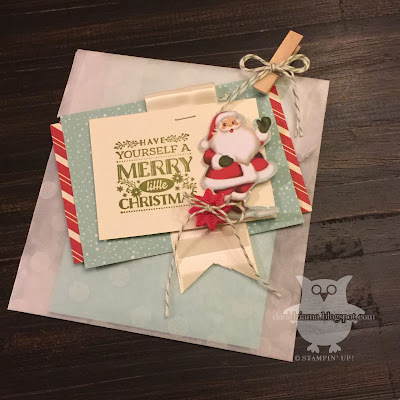 The make and take could either be mounted on a card to create a lovely Christmas card or it could be used as a tag. I think it's the perfect gift bag tag! What's in my little gift bag you ask? It is filled with some Holiday themed note cards. I'm not sharing them yet as this is just a teeny tiny little sneak peek! This little gift is SUPER adorable and I can't wait to share the rest of the products in this suite (as well as the Holiday Catalog) with you all! I hope you've enjoyed this little sneak peek! Want a Holiday Catalog of your own? Send me an email and I'm happy to mail you one just as soon as they are available! Hello there! Tonight I have an awesome special to share with you! From NOW until September 10th- new subscribers can sign up for two months of My Paper Pumpkin for half off! That's a fabulous deal! I've seen the sneak peeks at Convention for August and September and you DON'T wanna miss out! Not sure you wanna join? Be sure to sign up for my My Paper Pumpkin club event on Tuesday August 18th at 7pm and come see what it's all about! There will be sample kits and make and takes and lots of fun! In addition to the My Paper Pumpkin special- I'd like to share my My Paper Pumpkin thank you cards created exclusively for my My Paper Pumpkin Subscribers. 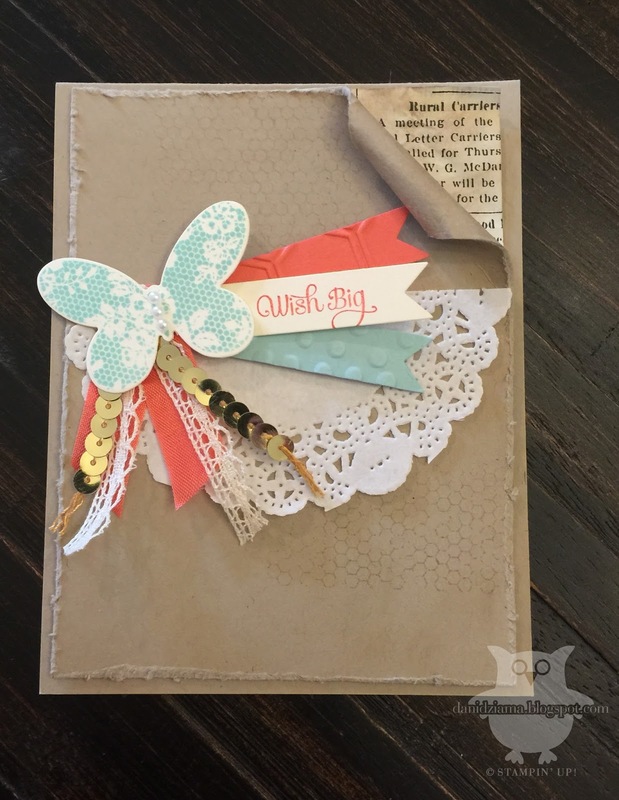 This adorable card measures 3" x 3" and is the perfect way to say thanks! Wondering where the adorable pumpkin stamps are from? 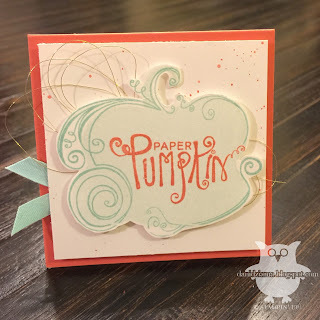 At the My Paper Pumpkin booth at Convention- demo's were able to purchase this absolutely adorable little photopolymer stamp set- complete with My Paper Pumpkin sentiments as well as the adorable pumpkin coach! Thanks for stopping by! As always- if you have any questions or would like to register for an upcoming class/My Paper Pumpkin event- please email me or call (734) 497-8521. Hello there and welcome back for the bi-weekly Monday Montage blog hop. I'm so happy you've joined us! If I am your first stop on the hop- great! If not- please use the links provided at the bottom of this post to navigate back to Cathy Casey or next to Dara Gloden. I know both have fabulous projects to share with you! As many of you know- I've been at the Stampin' Up! Convention in Salt Lake City for the past few days. This is by far one of my favorite events. I love that I get to be with others who are just as crazy about paper crafting as me! While in Salt Lake City- I had the great fortune of touring the home office, swapping cards, attending a team meeting, learning LOTS of new things, and saw some simply gorgeous new products. But most of all- my favorite thing to do at Convention is create new friendships. This year was no exception! I met a LOT of wonderful new friends and I'm sad that Convention has now come to an end. I am finally home after a long day of travel. 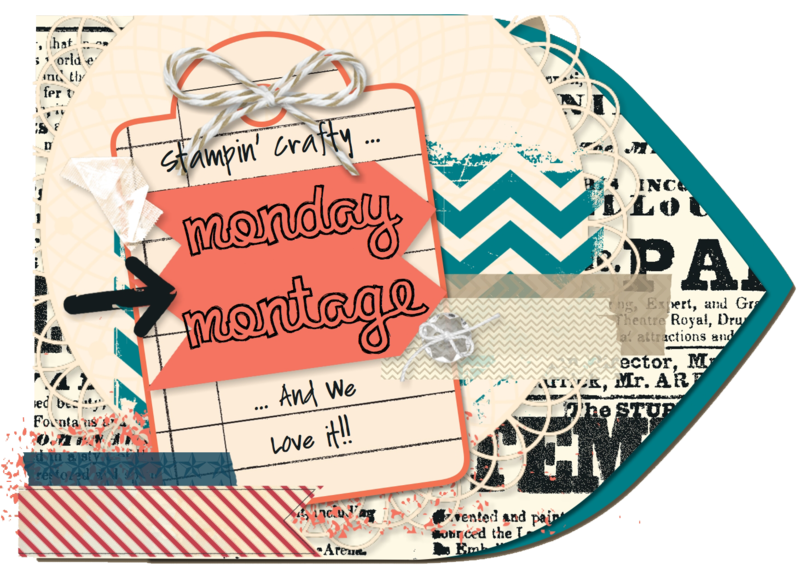 My project for tonight is the beautiful swap card that I created to share with my fellow Monday Montage blog hop friends. I hope they enjoyed receiving it as much as I enjoyed creating it! 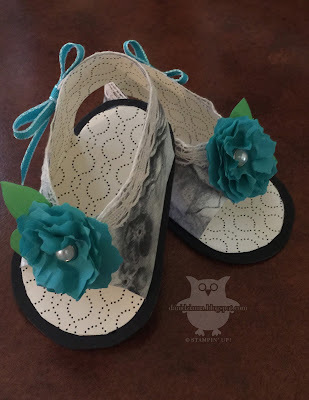 My little baby shoes were created using my favorite DSP- Timeless Elegance. I love the soft vintage look of the DSP. It's simply gorgeous! 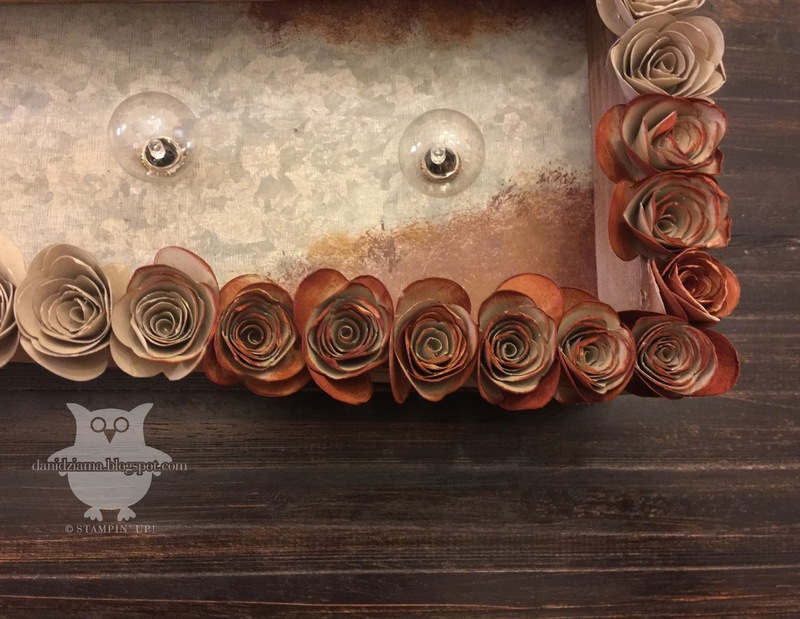 The beautiful flowers were created using the Cherry on Top Cotton Paper and the Floral Frames/Flower Fair framelits. Hello there! Tonight I'm sharing another project that I created for the Inking Idaho on the Road event a few weeks ago in Columbus, OH. For this project- I was asked to decorate this particular style Marquee Arrow. The arrow itself measures approximately 2' long and about 6" wide. It's definitely quite large and will make the perfect decoration. Now I just have to figure out where to put it! The arrow itself is wooden and the inside of the arrow is metal which has been weathered in several places. I loved the arrow just as it was so choosing how to decorate it was tricky! After toying around with several different ideas- I chose to go with this one! The rusted roses really add a lot of extra detail to this piece. I wanted to keep the same rustic theme that the arrow already had so I decorated the edges with some rusty roses! The Spiral Flower Originals Die is the perfect tool to create all the beautiful roses with! It just took a little time and patience! The picture below is a close up of the rust and the rusty roses. Not all of the roses were created the same. For some of them- the edges were sponged after the flower was complete. Others were sponged before they were rolled up into roses. Cajun Craze makes the PERFECT rust! 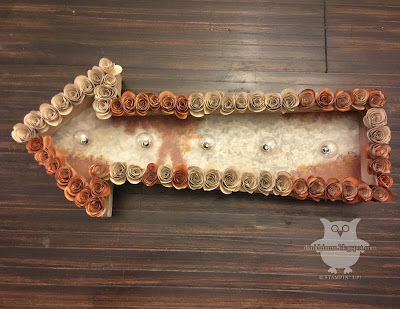 You'll notice that several of the roses are just plain but wherever there's rust on the arrow-I have made the roses in that particular area rusty as well. I hope you have enjoyed this project! It was a lot of fun to create and it is absolutely gorgeous! Thanks for stopping by!